Wives Wanted: For the cowboys of Mule Hollow! Dress store owner Ashby Templeton has provided many a wedding dress for the brides of Mule Hollow, Texas. Longing for love and a family of her own hopes to need a wedding dress for herself one day soon. But the only man in town showing any interest in her is the happy-go-lucky town flirt...exactly the opposite kind of man she&apos;s looking for. The cowboy is gorgeous but she&apos;s not looking for a hunk of burning love, but for a love that&apos;ll burn for a lifetime. If you love Christian romance that&apos;ll warm your heart, make you smile and laugh out loud ~ this is the series for you! Get your copy today! A Christian Contemporary Western Romance series. Inspirational Novels that will make you smile. Previously published as the Mule Hollow series. Note: This book was previously published as Her Baby Dreams. This edition includes some fun extras. A very good story. Clean and shows emotions and why you are the way you are because of how you were raised - but also showing how you can overcome them. Ashby does come across as a snob but then you find out why. Her mother raised her to be a 'lady' - no riding bikes or getting in the mud or making messes. Dan grew up with an abusive father but thankfully his mother left and they spent 2 years in a home for abused woman & children. Yes, you figure the two will get together - but what a trip getting there. Ashby moved to Mule Hollow to find a husband. The problem no one asked to date her, and vertigo, to be on a bike, and bets had been wagered. at a shindig for couples to meet. Dan has tried for a year, wanting to help her find a husband, but she won’t give the big flirt, the time of day. The town people say he would be perfect for her. For Dan there was a reason for him being a flirt. Till three wise men told him, to correct a bad past, be the best father you can. Finding love, is always delightful to read . 5.0 out of 5 starsPersistant cowboy finds the love of his life. 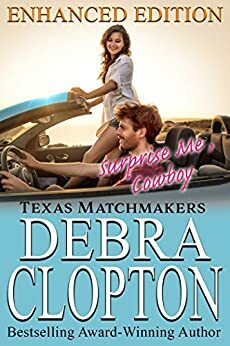 Enjoyed another great book by Debra Clopton. Dan and Ashby relationship got off to a bad start. She wouldn't let him get under her skin. He tried every which way to ask her out. But she wouldn't move an inch. Not tell he lost his home did Ashby come to the conclusion that she cared for him. But Dan had things to work through as well because of his upbringing. But with Ash help and also some of the townspeople. He was able to get through it. There love for each other grew enough for things to proceed. Ashby even helped him with a party to thank everyone. His love for her grew even more. He finally was able to propose to Ashby and all ended well. Ashby grew up with Mother wanting her to be frilly and marry well to do man. She suffers three breakups and moves to Mule Hollow to find husband. Dan and his Mother escape abusive man he end's up in Mule Hollow but thinks he will not be good Dad. He meets Ashby and slowly wins her over while falling in love with her but thinks he can't marry her because she wants children. After listening three wise men and a lot of prayers he sees that they can do this together. Love this series looking forward to more. 5.0 out of 5 starsGreat story! Surprise Me, Cowboy is an enhanced edition and is the eighth book in the Texas Matchmakers series. The wives wanted campaign has been good for business, but Ashby has been wanting to find her own happiness. That is why she came to Mule Hollow. But the only man showing interest is the one man that she feels isn't marriage material. Will Ashby ever get her happily ever after? Or will she just have to live with helping others find theirs? I really enjoyed this book. Definitely recommend it!